Eko Supriyanto’s internationally travelled Cry Jailolo featured in the Darwin Festival and Adelaide’s OzAsia in 2016, in this year’s Sydney Festival and will appear shortly in Brisbane’s new Supercell Dance Festival and Melbourne’s Asia TOPA, a three-month celebration of Asian and South-East Asian performing arts. Also in the Sydney Festival was the premiere of Balabala, a new work from Supriyanto’s EkosDance Company. Cry Jailolo features seven young male dancers (untrained until they worked with Supriyanto) from the remote community of Jailolo on the Indonesian island of Halmahera in the northern Maluku Islands (Moluccas). 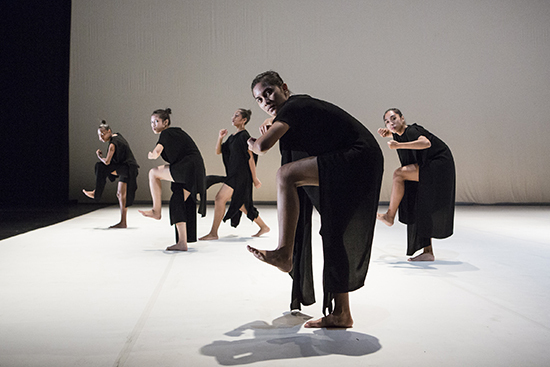 Supriyanto has created a contemporary dance work for them “inspired by the Legu Salai dance from the Sahu Tribe and Soya-Soya dance from North Maluku,” (EkosDance Company website), as well as traditional Indonesian martial arts. He aimed to empower young men living on an island which is fast losing its fishing industry to coral reef degradation. Hence the title, a call demanding our attention. Cry Jailolo will be travelling in our region and beyond for many months to come this year. As he explained in an interview, Supriyanto saw in the local dance the swirling movement of schools of fish and the way that individuals separate from and rejoin a school. The martial arts dimension, the work’s other polarity, indicates assertiveness, confidence and, Supriyanto told me when we met in Sydney, “preparedness.” He’d found in Jailolo, he said, a spirit of “get up and go” not so evident in, say, Jakarta. In near darkness and wearing only traditional knee-length pants, a solo dancer bounces lightly on his right foot and on his left too, but with the foot pointing upwards, barely anchoring him at the heel. His arms hang loose. The persistence of the rhythm and the complexity of this apparently casual foundational movement suggest strength and a great capacity for endurance—and this opening passage is long. The left arm is then raised and suspended defensively across the chest while the right rotates, resolving into a thrusting clenched fist, body tilted forward. 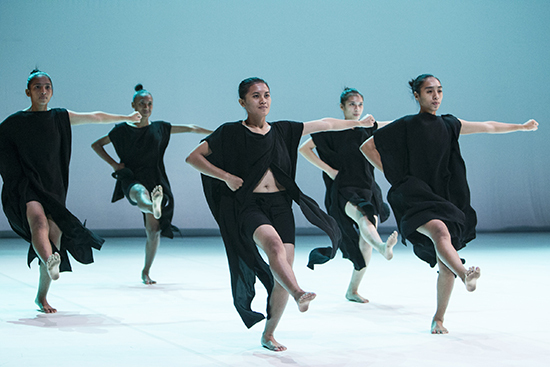 This and like shapes will recur throughout, to Setyawan Jayantoro’s haunting percussive score, as the dancer is joined by others, forming a cogent mass that travels as with one mind and body about the stage with seductive fluidity, arms twirling. Within the darkness and deep red ambience of Iskander K Loedin’s lighting-driven stage design, the group breaks into units, reforms and in one striking passage creates a circle within which another revolves counter-clockwise. Dancers appear to weave from one to another—the precision and subtlety is entrancing. Now and then an individual will glide speedily away from the cohort, still facing us like his comrades, only to return. There are also moments of storm-like turbulence and others of fraught cohesion. The martial character of the dancing is further enhanced by a uniform stance in which each dancer raises one knee, holding arms wide with hand and finger movements finely articulated to evoke traditional dance. This is again felt in a sinuous solo with arm-led spinning and a rocking, wide courtly stance. After a march-like passage and sudden running the performers disappear into upstage darkness and silence before remerging defiantly with a Haka-like challenge, arms raised high and wide and then with fists hammering repeatedly into palms. All fall and rise and a solo dancer gracefully completes the work’s assertion and celebration of community, of the individual and oneness with nature. A solo performer enters in a deep blue circle of light with white at its centre, and is still. She sways gently, arms loose then lifting and falling across her body to what sounds like a folk song, sung by a woman soon joined by layered voices. The dancer’s movement accelerates, arms moving up, down and out, fists closed, legs stepping wide and drawn back in. The movement is less tightly articulated than in Cry Jailolo’s opening and is something that Westerners might suspect as belonging to a folk idiom (so too the accompanying singing). Two more performers take centrestage (the space now white and subsequently alive with shifting colour; design Iskander K Loedin), lowering their bodies at the knee and progressing with long slow strides and arms twirling in and out in soft circlings. As the recorded vocals (composer Nyak Ina Raseuki) move from delicate formal patterns to jaunty song, the initial performer executes a high stepping dance about the stage, resolving downstage into an assertive posture—body low, left foot far forward, right arm held back, left to the front, anticipating the martial arts dance to come. To a multi-tracked slow, gliding calling of the word “Jailolo,” another dancer executes a slow, low turn, fists raised to her chest and then held wide. She initiates a lively dance, joined by the others, hands above heads, then extended, legs kicking out left and right, bodies spinning; it has the folksiness of an earlier passage and the bounce of the previous stepping dance. The five performers line up across the stage, facing forward and, to march-like drum and gong, uniformly adopt that dance pattern, over a long period, in various formations, with individuals separating out and returning, as in Cry Jailolo. Towards the work’s end, martial shapes are assumed—arms raised, elbows out, hands on hips—triggered by a gong. The formation of a line moving defensively back and aggressively forward precedes an expressive solo. What ensues is less certain—four of the dancers raise quivering fists and all speak and call out volubly to each other. (There is no translation. Supriyanto tells me later that the women are simply speaking about everyday things. Some transparency here would be helpful.) A lone dancer holds her body low, ready to attack, lunges forward, leaps back and leans towards us again, completing Balabala and complementing the warrior strength of her peers, carving out and holding newly won space. Balabala is a new work, less formally structured than Cry Jailolo’s highly developed, exquisite patterning, more loosely expressive and due for inevitable tightening of some of the longer passages and focusing of images as it matures. The confidence of the performers, their sense of freedom—aided by loose black costuming (Oscar Lawakata, Erika Dian) that flows with and reveals the body, rendering it heroic—and their passion, evident in the strength and poise of their martial posturing, suggest another significant work in the making.